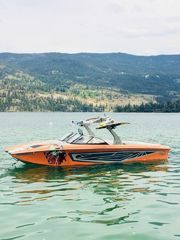 After testing a pre-production version of these racks last summer, we’re confident anyone who paid the high price of a premium wakesurf board will want them. 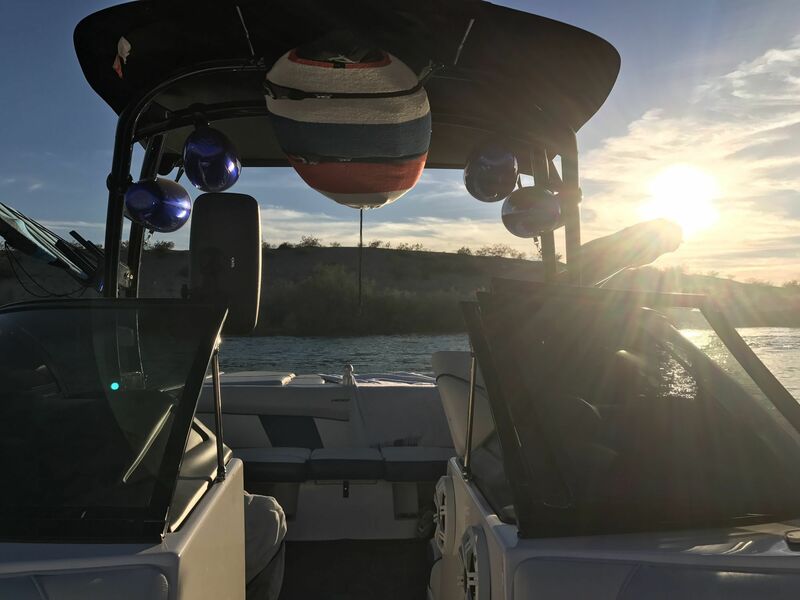 This is especially true if you own a Malibu G3 tower and matching bimini, as these racks paired perfectly with our setup; the boards could be stored overhead with the fins up, out of view, and completely shielded from the sun. We expect the same will be true for many towers, especially those that are forward facing for maximum sun protection. At $499 a piece these overhead racks sound expensive, but perhaps not when compared to traditional side-mount combo board racks, or the newer clamping racks, which don’t offer as much protection. However you'll be limited to two racks per tower — and typically one board per rack — which means as much as we loved them they are probably going to be an add-on, not a direct replacement for existing side racks. Every surf board owner is inundated with warning decals and unabashed reminders from manufacturers that our surf boards are “fragile,” susceptible to “dings and dents” and should be kept “out of direct sunlight” at all costs. While that makes sense, it often means the more expensive and lightweight your board, the more easily it can be damaged. Surf boards are simply not constructed in heavy-duty fashion like a wakeboard, for good reason, which leaves most of us clamoring for protective board bags and better storage in the boat after dropping $600-$1200 for each board. 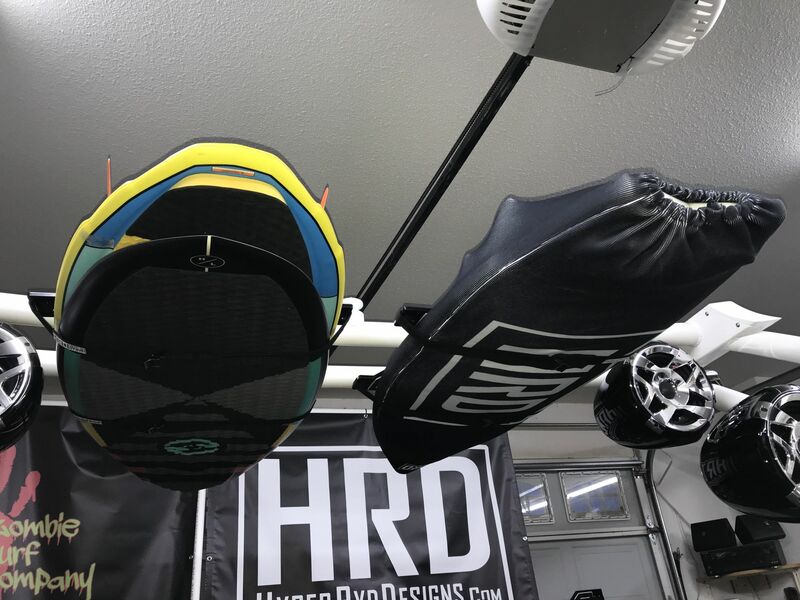 Enter the XR-1 Overhead Surf Rack, launching this week at the Los Angeles Boat Show by HyperRyd Designs, a new company created by a familiar guy. 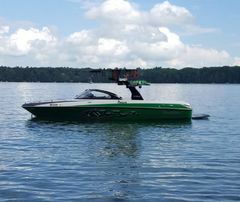 You’ll recognize the user name, “Hyperryd” (aka John Lee), as one of our own Wake Garage members, who has posted many boat modification projects over the years while quietly launching a startup company and refining his rack design. 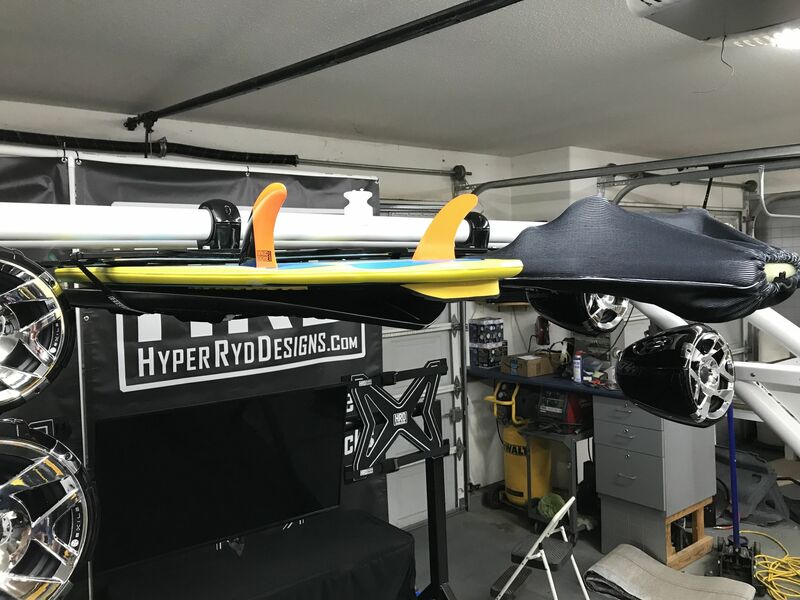 According to John, "The patent-pending HyperRyd XR-1 racks will protect your board from damage caused by bouncing while the boat is under way, protect it from sun damage and offer an overhead storage solution." We found storing the boards overhead also keeps them off the boat’s upholstery and lessens the chance of damaging a board jamming it in and out of storage compartments (for those boats that do have extra large compartments). Do they accomplish this? Yup. Most definitely. While we tested a pre-shipping version of the racks, there were really just a few subtle fit and finish changes made to the final production version. We switched between five to seven riders, which meant our surf boards went up and down to the racks an awful lot. 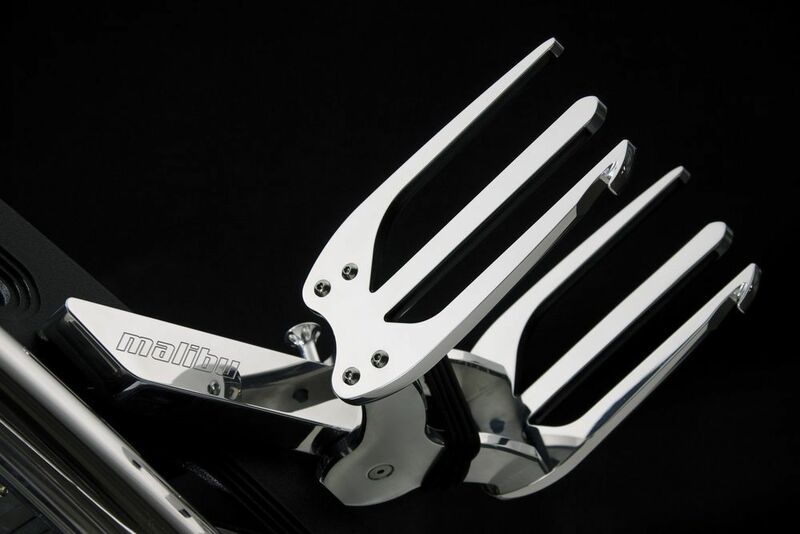 This gave us a pretty good feel for long-term use, and how the functionality compared to our OEM rotating side racks. 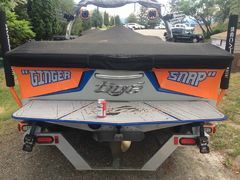 Our boat is a Malibu 247 LSV, which has a Malibu G3.2 tower with the matching factory bimini. Malibu execs reading this, you may want to facilitate this combination. Take a look at the pictures and you’ll see why. Boards can be stored fins up and out of the way. We even found there was plenty of room even if you stored the boards with the fins down. In this case, it made it easy to switch fin configurations as well. Here you can see the cinch strap, which is quick and holds well. These were not the final velcro backed trimmed straps but they worked awesome anyway -- all summer long. Even with the boards up, we were stoked to maintain access to the rope storage pockets in the stock Malibu G3 bimini, however that will depend on your particular tower setup. The racks use a low-profile mounting base made of 10 mm thick, T6061 anodized aluminum that’s covered with an EVA cushion foam layer to protect the boards. The base attaches to the tower’s cross tube using aluminum clamps with rubber inserts to accommodate different diameters. Each rack measures 22.5” wide by about 17” long, which means most towers can hold a max of two racks, side-by-side. While most boards don’t typically exceed 21” in width, these racks will max out at 22.5” wide, so unless you have a really, really wide custom board, they will fit yours without issue. You’ll also need 23” space on your tower for each rack, which means some tower and speaker configurations will be limited to just one rack when mounting to the cross bar. The taller your tower, the more head room you’ll have. Holding the surf boards horizontally with a wider base seems to offer more stability by spreading the load across more of the board. Each board is then held snug to the rack base using two padded cinch straps, which we found to hold the boards fairly motionless while the boat is underway. The straps then fold back onto themselves and attach with Velcro to keep from hanging down (the pre-production straps we tested were longer, which meant they had longer tails to tuck away as you might see in the pictures. ) The boards can go up and down quickly and easily, in fact much quicker than using the bungee cord strap of our our OEM side racks (even though we may be splitting hairs on this). But being able to put a board straight onto an overhead rack without first having to stuff it back into a bag each time for a side mount rack is priceless. Do they really hold better? Yes, the HRD racked boards were for the most part, motionless, but the difference was not as much as we thought. That's because we didn't get as much bouncing out of the stock OEM combo racks as much as we expected. But when you put your hands on them you will really understand the difference. And we also agree the flat base and strap system will better balance out the stress on the board vs forks. Can it hold more than one board per rack? Yes, and no. It’s not officially recommended, but you can technically stack two of the thinner compression-molded boards pretty easily. The thicker foam core surf style boards may require longer straps to store more than one. I’m sure one of our creative Wake Garage members will find a way to stack more. However double stacking the boards also means less overhead clearance, which was one of our favorite benefits of this product. During our testing, we cycled several different surf boards on and off of the racks, primarily a Soulcraft Emily, Soulcraft Voodoo, Ronix Koal Thruster and even a classic Triple X Nitro board. We eventually found it best to keep our most fragile boards on the HyperRyd racks and everything else in boards in bags or socks using the stock side racks or top surf pockets of the stock bimini. You can also store your boards in the bags and still use these overhead racks if desired, although we rarely did that because the boards were shielded well from the sun without them. It looks like the fins were facing down in the photo below, but there was still plenty of head room with the board and bag as well. With the black bags on the boards essentially disappeared from view under the black bimini. Since we tested a pre-release version, we did not get to see final packaging with assembly instructions that are available today. Not to worry, the racks were self explanatory… (and if we needed more help we’d probably not be qualified to moderate on Wake Garage anyway). You’ll need a tape measure, something to mark the tower with to find the centers for each rack, and a 5.0 and 6.0 Allen wrench. If you have removable tower speakers make sure you account for them when you mark the centers. In our case, we had a pair of Wetsounds Rev10s to squeeze the racks between which was not a problem. Plenty of room for two racks and those monster speakers on our setup. There were a few refinements to the shipping version hardware as well, but you can probably get the idea on mounting from these installation pictures. If your tower is curved, like the G3, the racks will curve with it. Not an issue but you may have to slide the clamps a little off center and tilt the rack face to find the position that works best. In order to get it perfectly flat, you would need custom mounts with offsets to match each brand of tower. In some tower configurations you might need to be creative on where you place them, including on top of the tower. This loses the benefit of the bimini protecting a board from sun exposure, but it will hold your board securely in the bag in those cases. John showed us examples of side mounting these racks as well (below), although it’s not the ideal location for this design. 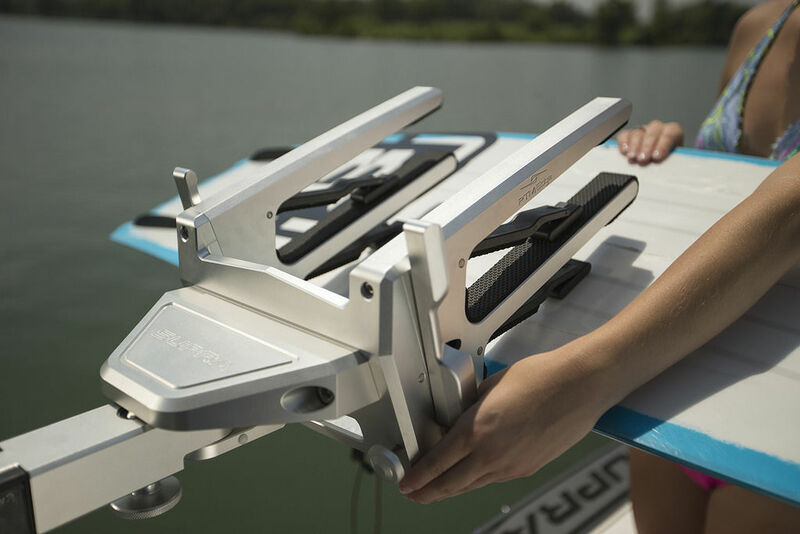 Most traditional side-mount racks are simply wakeboard racks with a wider gap in the forks to accommodate different widths of boards, which creates more movement while the boat is underway, exposed to the sun if they are not in a bag, and possibly puts more defined pressure points on the board. 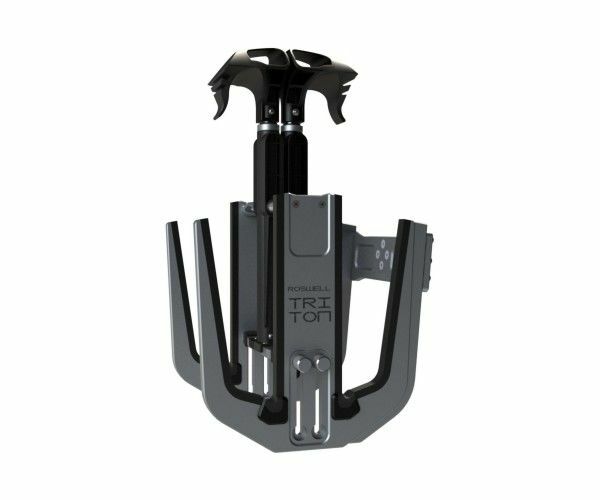 Newer style clamping racks (OEM versions or aftermarket such as PTM Edge strapless rack at $3,695 pair, the Roswell Titan Strapless board rack at $1599 each, or the new Skylon version of a similar design) are amazing wakeboard racks and offer big improvements for surf boards by enabling us to adjust to the width of the board perfectly and improve load disbursement. But to keep them out of the sun, you’ll still want to keep them in a protective bag, or at least a board sock. 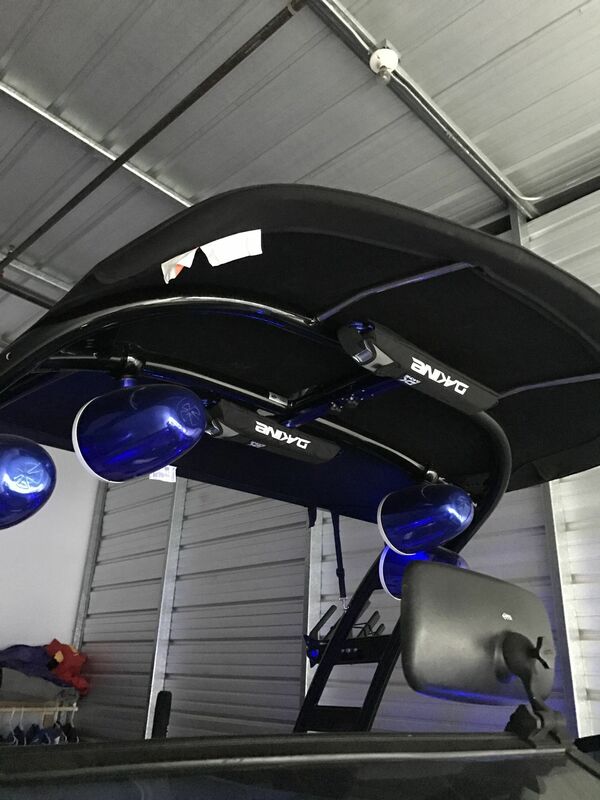 We’ve seen other overhead racks such as the Agenda Overhead Surf Rack, by Corson Piper. There are a few installation projects of this rack here on Wake Garage as well. Credit Corson Piper for getting these boards overhead and out of the way. The primary difference between the Agenda/Corson Piper rack vs HyperRyd Designs appears to be the lower profile mounting surface vs thick padded mount bars. 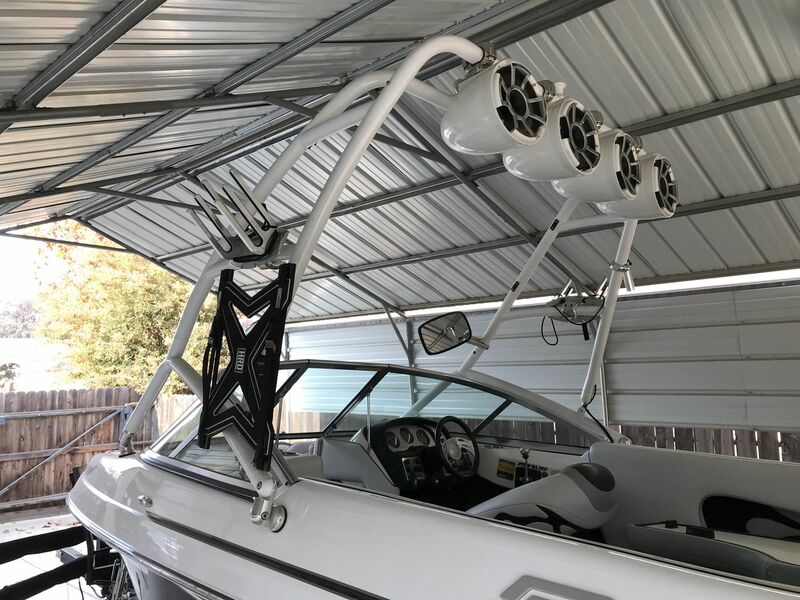 There are many happy boaters out there with the Corson racks, and we think people will love these HyperRyd racks as well. 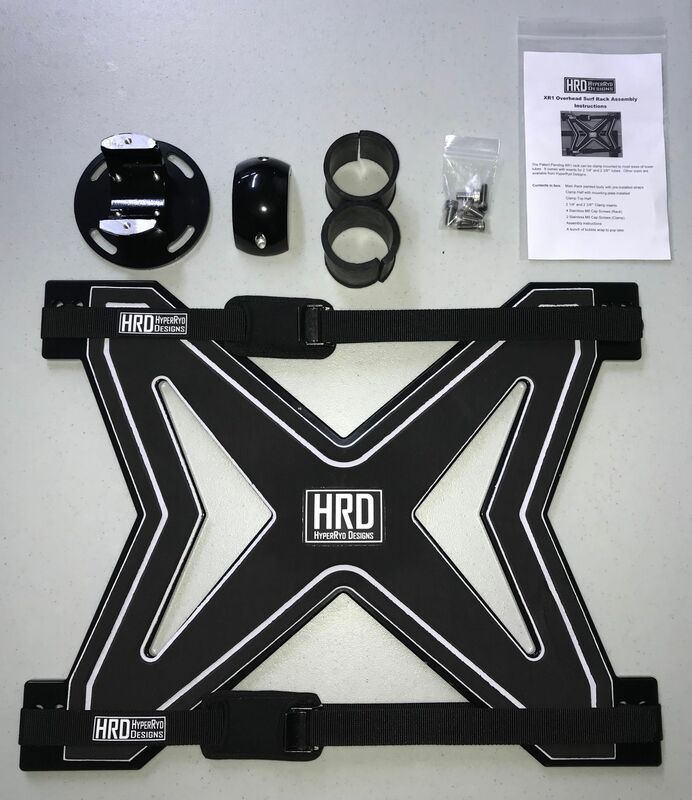 The HyperRyd XR1 Overhead Racks currently come with inserts for 2 1/4” and 2 3/8” tubes which cover most of the newer towers, as well as 2 1/2” and 3” for larger diameter towers, such as on Axis towers. According to John, there are alternative mounts available, such as 4” and 5” offset brackets, to provide a greater flexibility in mounting options, as well as a hocky puck style bracket for the cast towers (below). In short, we love the HyperRyd Racks and recommend them. This is not a complicated product and the benefits are fairly obvious: they keep your boards snug tight, up and out of the way, and more importantly, out of the sun. If only we’d had these racks before our Ronix carbon thruster delaminated from the California sun while sitting in the side racks…I’m hopeful it would have lasted more than one summer. You can bet our Soulcraft custom boards will only be used with these new racks on the boat, and stored in padded bags when they are not. Hope that helps!! Post your questions below and we’ll get answers!